In the back room of the NW Cannabis Market, the dab lounge makes it possible for patients to sample extracts from the medical marijuana vendors up front. The NW Cannabis Market on Seattle's Rainier Avenue is open 7 day a week. Access is restricted to medical marijuana patients authorized to use medical cannabis in Washington State. At the dab lounge, a budtender skillfully wields the blow torch, making it possible to relax and do nothing but inhale the vaporized fumes of the many extracts available. Prices range from $3 - $7 suggested donation per vaporized puff, and a wide selection is available. Basic extracts are priced at a recommended $3 donation (and Tuesdays are 'double dab' Tuesday where 2-for-1 pricing applies to selected dabs), CO2 extracts priced at $5, and some special extracts priced at $7 donation. For $7, I tried a cryo-purged BHO (Butane Honey Oil) product. The budtender took out the small container of extract, and pulled a tiny amount onto the metal dabber stick (I selected the one with the Godzilla head on it). She fired up the blow torch and heated the metal bowl (the "nail") at the end of the glass waterpipe until it was glowing red hot. When I was ready, she 'dropped the dab' onto the side of the 'nail' as I inhaled through the cooling water. She warned me not to hold the smoke in too long as it would expand in my lungs. I took her advice and exhaled the first hit mostly through my nose to enjoy the full aromatic spectrum of the extract. I survived with my lungs in tact but a distinctly peppery burn in my lungs. It was smooth, but I certainly felt the power of the concentrated smoke. At the end of the exhale, the budtender smiled and handed me a cup of cold water. Before preparing a dab for my companion, she opened an alcohol wipe and cleaned the mouthpiece of the waterpipe. We sampled a $3 dab next. The difference between a $7 dab and a $3 dab is primarily smoothness (the $3 dab was a bit rougher on the throat going down) as the potency seemed similar. Most concentrates sold at the market reportedly range from 60-90% THC. A heavy hand during the extraction procedure can strip all the delicate aroma and flavor rich terpenes from an extract. Likewise, failure to completely remove the solvent can lead to off tastes and outright toxic products. 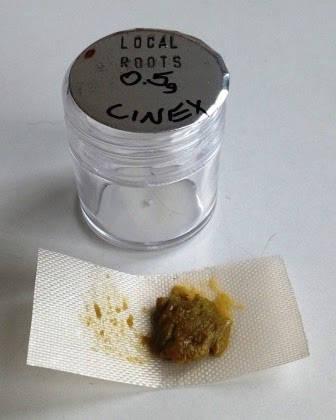 All of the 'dabs' we saw and smelled during our visit to the NW Cannabis Market appeared to be acceptable - and in some cases excellent - products. The dab lounge at the Galaxy location of the NW Cannabis Market is open 7 days a week. The White Center location also has a dab lounge open on occasion. Because the product is vaporized and there is no smoke involved, it seems that indoor smoking ban legislation does not apply to such operations. Of course, a multitude of other prohibitive legislation will slow the spread of such establishments. A home set up for enjoying extracts can be purchased from one of the vendors of glass smoking accessories at the market. There are specialized devices as well as 'nail' attachments which can be attached to a multitude of standard waterpipes. Concentrates may also be mixed with cannabis flowers and rolled, or smoked through a pipe or waterpipe. Editor's note - A full Stoner Living report on home options for enjoying BHO or 'dabs' is in the works for April. 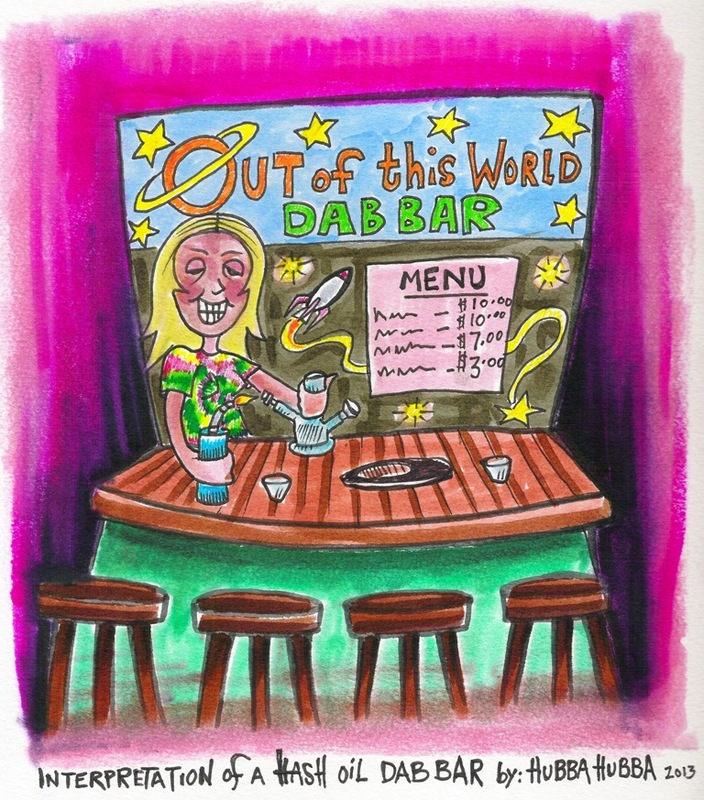 Where do these dab bars lie on the legal spectrum? U been looking for me?